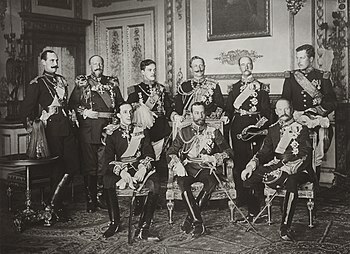 Original – The Nine Sovereigns at Windsor for the funeral of King Edward VII, photographed on 20 May 1910. Standing, from left to right: King Haakon VII of Norway, Tsar Ferdinand of the Bulgarians, King Manuel II of Portugal and the Algarves, Kaiser Wilhelm II of Germany and King of Prussia, King George I of the Hellenes and King Albert I of the Belgians. Seated, from left to right: King Alfonso XIII of Spain, King George V of the United Kingdom and King Frederick VIII of Denmark. Encyclopedic image of largest gathering of monarchs in European history.